The Joseph Beuys Sculpture Park was established in April 2001 as part of a larger tree-planting effort that supported projects across the Baltimore region. Designer Renee van der Stelt, project coordinator for UMBC’s Fine Arts Gallery, now the Center for Art, Design, and Visual Culture, developed the Joseph Beuys Tree Partnership with a mission to “extend beyond the gallery walls [and] bring art to the people.” Joseph Beuys, a German avant-garde artist who emphasized natural materials in his work, inspired the new sculpture park—especially his most famous piece: 7000 Oaks. In the fall of 2000, hundreds of children and adults pitched in to bring “social sculpture” to Baltimore. With help from nearly two dozen community organizations, the Joseph Beuys Tree Partnership organized volunteers to plant trees and rocks throughout the city. Annapolis-based TKF Foundation, an organization that promotes its mission of peace through the development of green space, provided funding for the Tree Partnership. 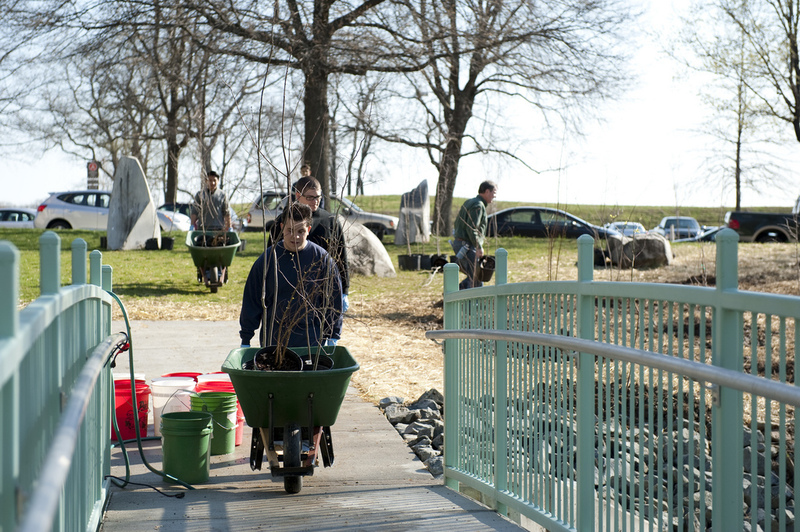 The volunteers planted trees in Patterson Park, Wyman Park Dell, and Carroll Park in Baltimore. Later, stones were installed in each park to continue the Beuys model. The thirty oak trees and thirty granite stones planted on the UMBC campus in spring 2001 completed the project. 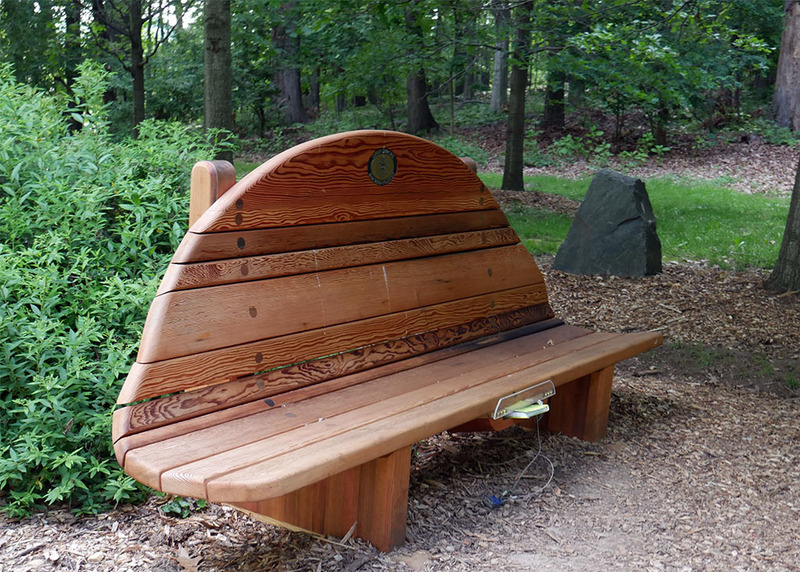 Visitors to the UMBC Sculpture Park can find a journal stored under one of the benches. The book provides an opportunity for visitors to contribute to the social sculpture by recording their thoughts and feelings. In 2011, the journal entries became source material for a music and dance program entitled “Creative Acts: Site Specific Dance & Music in Joseph Beuys Sculpture Park.” UMBC students composed and performed the music for a program hosted by the UMBC Center for Art, Design, and Visual Culture (CADVC). Their original works expressed “a dialogue between the human instinct to preserve and enjoy nature while also transforming and polluting it.” They encouraged the audience to add to the journal during the performance, continuing the interactions that make up the social sculpture. The Joseph Beuys Sculpture Garden, along with its sister parks throughout Baltimore, is a space in which the art is constantly changing. Its material is not just the wood and stone, but the oxygen which the trees contribute to the air to combat the car exhaust from the adjacent parking lot, the minerals slowly eroding into the soil from the granite, and the deep breath that a harried college student takes when she stops for a moment on the bench and records her frustrations in the field journal. All are in relationship, and all are participating in the social sculpture. Susan Philpott and Sarah Huston, “Joseph Beuys Sculpture Park,” Explore Baltimore Heritage, accessed April 19, 2019, https://explore.baltimoreheritage.org/items/show/550. Published on May 16, 2016. Last updated on Nov 27, 2018.